At the beginning of the year, Dave Jones did a very interesting tear down video of a FE-5680A Rubidium frequency standard. Rubidium standards are a type of atomic clock, which are able to keep very accurate and stable time. While not as good as cesium clocks, rubidium references are still able to keep time on the order of 2x10-10, which works out to be 6ms of drift per year. 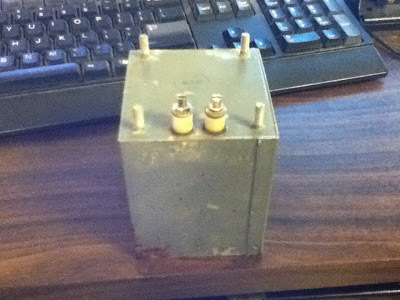 Normally, rubidium standards are very expensive, but it is possible to find these modules on eBay for $50-$100 as they come out of decommissioned equipment (such as cell phone towers, which need this level of time stability). On a hobbyist bench like my own, these standards are useful as a very good time base to calibrate other oscillators against. They're also useful because 10MHz is the standard time base used by bench test equipment, so this standard can be used to drive frequency counters and spectrum analyzers via their time base ports so that they are more precise than with their stock internal 10MHz oscillators. When you buy the module on eBay, it comes as a sealed package with a single DB-9 connector on the side for power in and signal out. After accidentally blowing up one of these standards when fly-wiring these power connections (The FE-5680A does not like 15V applied to the 5V pin), I decided to build an enclosure around it, so that powering it up now only consists of plugging in a 16V laptop power supply, flipping a switch, and waiting for it to heat up enough for the PLL LED to light. I glued threaded standoffs to the inside of the case to mount the FE-5680A on, but glued the 7805 linear voltage regulator for the TTL supply directly down to the case, since its less likely I'll ever want to scavenge the 50 cent regulator than the $75 frequency standard module. 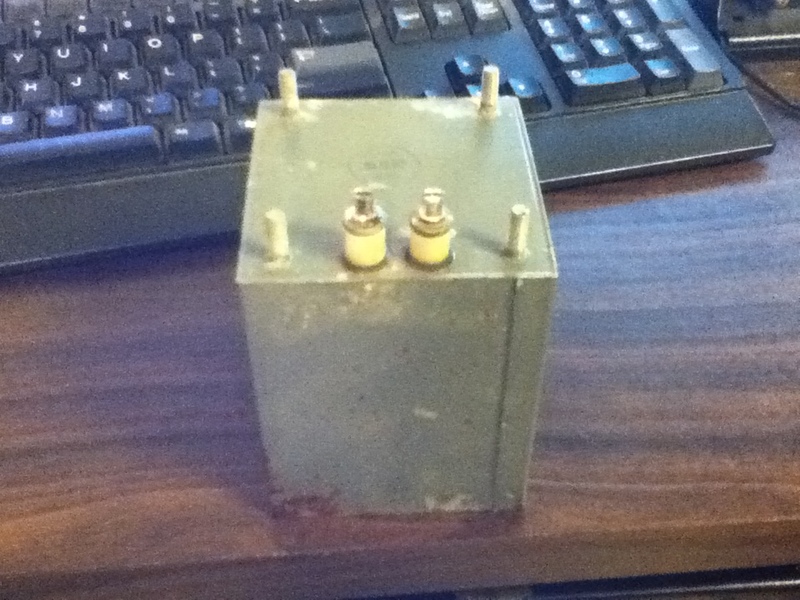 I used an interesting trick that one of my amateur radio friends taught me this summer about how to get good thermal contact between a power package and a metal case without drilling into the case. Apply thermal paste across the majority of the case (A TO-220, in the case of a 7805), but carefully leave two opposite ends free of thermal compound. Apply two small dabs of epoxy on the free corners to fix the package down, without needing any sort of special thermally conductive cement to maintain good thermal contact. The FE-5680A gets hot. This is on purpose. Many people mount it to a heat sink when they enclose it, but don't realize that the FE-5680A is thermostatically heated, so any heat sink you attach to it will only cause it to draw more power until it has reached the same temperature. The loop lock indicator (pin 3) is both an input and a output. It goes low when the standard has achieved phase lock with it's rubidium lamp, but will stay unlocked as long as you externally hold the pin high. This means that you can't use this pin to directly drive an LED, but need to buffer the LED with a transistor. I used a 2N3906 PNP transistor, and a 10k resistor from the transistor's base to pin 3. 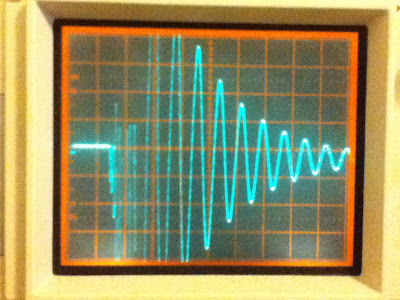 Article by VK3UM from when he tore down his FE-5680A. I recently came into possession of two "boat anchors," which is slang for vacuum tube powered radio receivers (since they weigh a LOT). Both of them were pulled out of an e-waste pile, and were both well beyond saving. I pulled them to strip them for parts before returning the carcass. 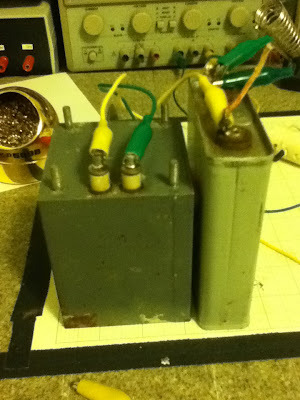 This has yielded several interesting components (a CRT tube, tube transformers, an assortment of vacuum tubes and matching sockets, etc), but one of particular interest is the two chokes from one of the power supplies. 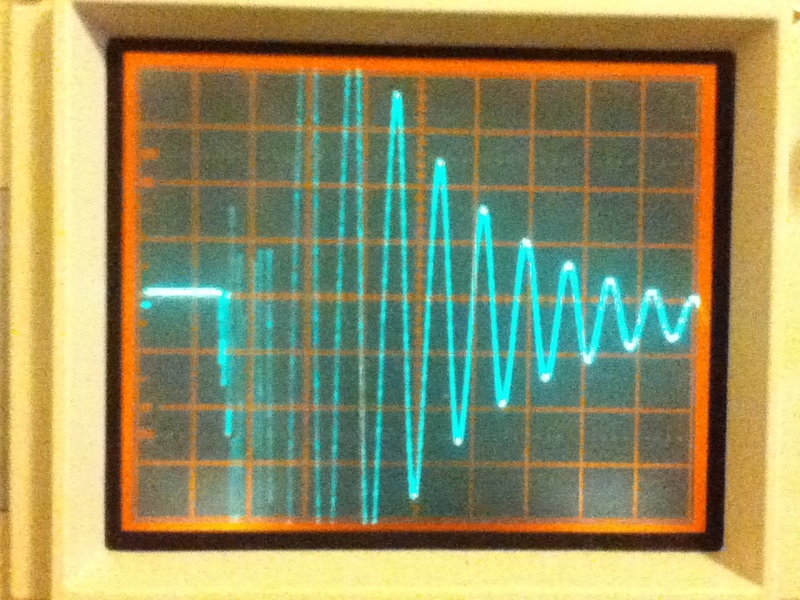 After rectifying 60Hz wall power to be DC, it still has large amounts of ripple in it which needs to be filtered out. This is usually done with a capacitor, but when you're working with several hundred volts, getting enough capacitance to filter out all the ripple can get unreasonable, so in addition to the capacitors, inductors are used. The interesting part is when you spend enough time cleaning dirt and grease off the labels to figure out that these are EIGHT HENRY inductors. Eight Henrys is huge. Typical coils of wire are measured in μH, or some of the large power inductors in mH, but these monsters are 8H. In response to me posting a picture of these on Twitter, Tony Long pondered what the self-resonant frequency of an 8H choke is. I was curious as well, so I hooked one of these inductors up to my oscilloscope and gave it a 15V pulse. Every inductor has a frequency at which it by itself will tend to ring, but while most inductors have this frequency in the MHz, this one rang at 5kHz. The scope capture above is at 200μs and 50V per division. Yes. 50V per vertical division. 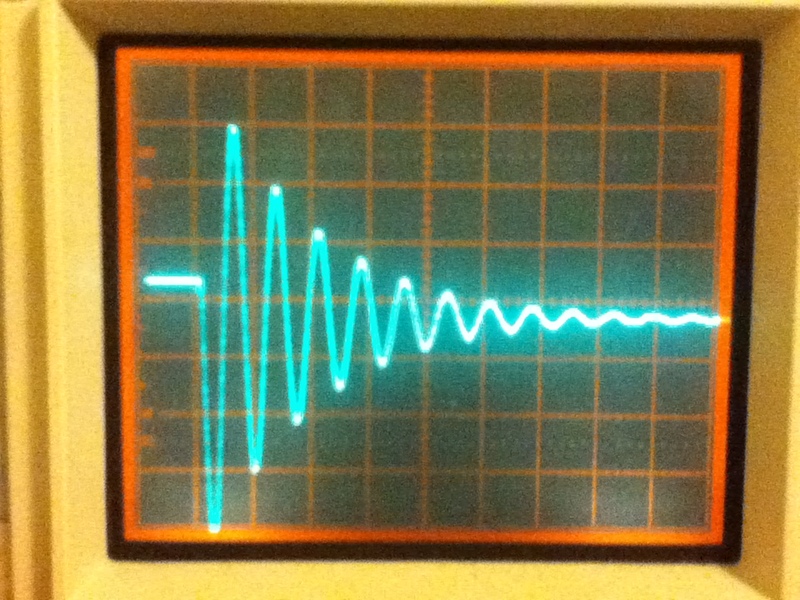 Just giving this inductor a 15V pulse, it rang with 500V peak-to-peak. This of course then begs the question: how low can you go? 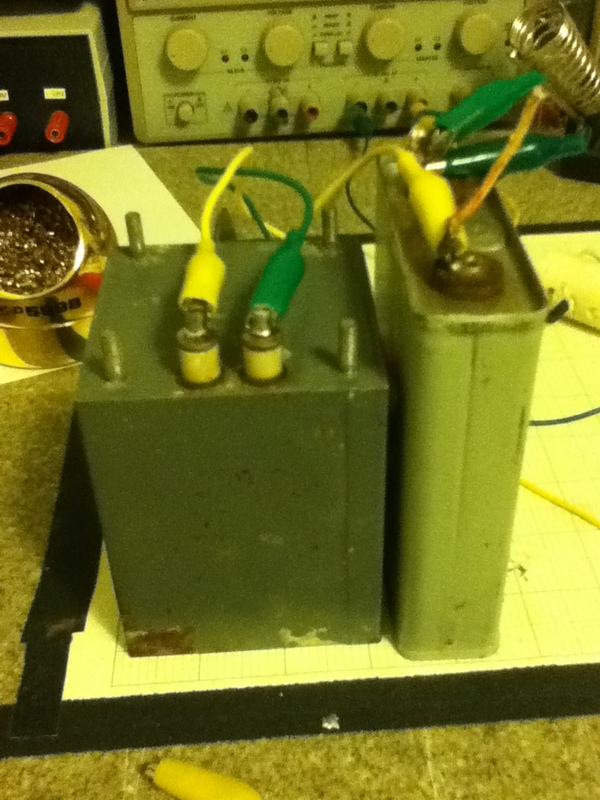 I wired one of the 8H inductors in parallel with a 10μF 600V oil-filled capacitor pulled from the same rig. In parallel, these form a resonant LC tank, with a resonant frequency that's a function of the square root of the product of the two. This LC pair resonates at 12Hz, which is crazy. 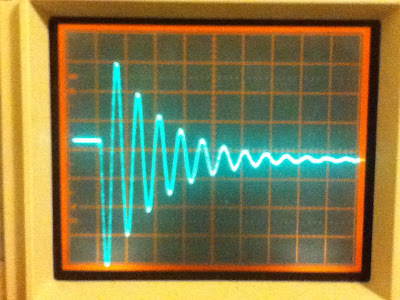 Usually, getting an LC circuit to even resonate as low as audio frequencies is challenging, but here we've got one which resonates at infrasonic frequencies, and with plenty of arcie-sparkie to go with it. Moral: Always dig through e-waste piles, and make sure you always have a friend with a pickup truck. As any of my regular readers have probably noticed, things have been fairly quiet from me online lately. This isn't because nothing has been happening, but because there has been so MUCH going on I haven't had anywhere near enough time to work on personal projects and document them on here as usual. One of the more exciting things I've been working on this quarter is my involvement with the Cal Poly Amateur Radio Club. I originally got my amateur radio license (W6KWF) while attending UC Davis for my bachelors degree in mechanical engineering. There was essentially no ham radio presence on campus, so I remained relatively inactive at the time, and did little more than operate for field day every year. Now that I'm attending Cal Poly, I'm thoroughly enjoying participating in this very active and well-run club. CPARC not only has a 2m/440 repeater on-campus, but our own club room in the electrical engineering building outfitted with two HF rigs, and a newly built 70' tower attached to the building. The ham shack has been a nice place to relax between classes and shoot the breeze, but what caught my eye in the shack was the corner covered with tiny drawers full of components. I started digging through the component collection to see what an amateur radio club stocks for it's member's projects, but started finding some strangely old components in the drawers... and almost none of what you'd expect hams to need (op-amps, voltage regulators, RF connectors, perf board, etc). After talking with several of the club's officers, it appears that no one has touched the shack's components collection in at least a decade. That would explained why the most advanced microcontroller I found in the collection was a Zilog Z80, and that the collection included several sets of 1970's style manufacturing reject transistors and the like. Clearly, something needs to be done about this neglected collection of drawers. An amateur radio club that doesn't promote the building electronics component of the hobby is missing out on what I feel is a significant and educational part of the hobby, and an EE degree. This is why I've now volunteered and been elected as the Projects Coordinator officer for CPARC. As the Projects Coordinator, I've been cleaning out decades of collected trash in the electronics work bench area, and am putting together a number of useful and easy-to-build electronic projects for the other club members to help them get started in home-brew. I'm also putting together a number of educational presentations on building your own electronics, which I will be giving during our biweekly meetings throughout the year. Finally, I am working to restock the ham shack with a useful set of components so that members can find the parts they need. This is where you, my loyal readers, can possibly pitch in if you would like to help. Unlike other engineering clubs that enjoy the support of a large national organization and yearly membership dues, the CPARC club has no regular source of income, and the additional burden of maintaining an unusually large amount of equipment, for a school club (radios, antennas, the repeater system, etc). As the projects coordinator, I'm going to need a few hundred dollars in order to restock a club's worth of components. I'm already working with a few different corporation's university programs to donate any of their products I need (op-amps, voltage regulators, etc), but this doesn't cover all of the other, unbranded, components like perf board, passives, enclosures, etc. In addition to a thank you letter for any size donation, I am also going to send (kickstarter-style) the first three cash donations of at least $100 to the CPARC components fund a thank you gift of a Motorola 1N4002 diode still in its original cellophane wrapper. I found these while digging through the long neglected components drawers, and thought they were rather entertaining. I hope this gives you an idea of how neglected this collection has been. I look forward to any support you can provide us, and hope to put as much as possible that happens at CPARC back up on this site for your enjoyment. If you have any questions or comments, please feel free to send me an email.